With support from the Arts and Letters Summer Internship Program (ALSIP), students from Notre Dame’s College of Arts and Letters gain experience and explore career options in a variety of real-world environments, from the U.S. Consulate in Japan to the set of Late Night with Jimmy Fallon. The grant program, administered by the University’s Career Center, provides Arts and Letters students with funding to defray cost-of-living expenses for both paid and unpaid internships in any industry or geographic location. In the four years since it began, ALSIP has given more than $400,000 in funding to approximately 200 students in the College. 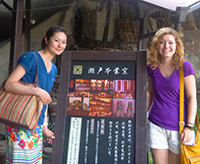 After studying in Japan for the spring 2013 semester, Japanese and sociology double major Margaret Pickard spent her summer interning at the U.S. Consulate in Nagoya, Japan. Pickard says she really enjoyed the environment at the consulate, and worked hard to improve her language skills as she took meeting notes and wrote reports in Japanese. While there, she also gained valuable experience in economic affairs and international diplomacy. “I definitely became more interested in diplomatic relations,” Pickard says. “I spoke with a lot of people about foreign affairs and what that entails.” She also had the opportunity to tour Toyota’s main plant with company officials and to accompany her boss to meetings with politicians during the Japanese election season. After graduation, Pickard hopes to find a job with ties to Japan. But an internship like this, she says, is beneficial no matter where a student’s future career path leads. Every night millions of viewers across the United States tune in to Late Night with Jimmy Fallon. This summer, senior Nick Desmone gained a different perspective as an intern on the show, working at NBC Studios in midtown Manhattan. 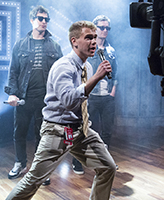 During his internship, Desmone, a film, television, and theatre major with a minor in business economics, stood in for talent in the studio, conducted research on upcoming guests, selected a test audience for Fallon’s monologue rehearsal, and ran miscellaneous errands for writers and producers. Desmone also had the opportunity to sit in on the morning production meeting where the head writer and executive producers planned each night’s show. “It definitely confirmed my passion for producing and writing and also allowed me to speak with writers who were in the same position as I am now. Through her internship at Santiago Adventures—a travel agency in Santiago, Chile—senior Tori Creighton not only gained experience in the field of marketing, but also improved her Spanish skills and learned more about a different culture, she says. Creighton says her background in the College of Arts and Letters prepared her to succeed in the numerous tasks for which she was responsible during her internship. As a marketing assistant, she translated materials from Spanish to English, worked with sales quotes, and used social media to connect with potential customers. 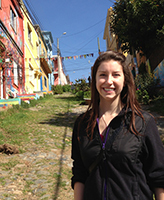 Although Creighton had studied in Chile before, she says the internship helped her build her “business vocabulary” in Spanish, as well as her knowledge of business cultural practices abroad. Psychology major Michelle Baranay, a senior who plans to pursue a career in social development research, was able to work within her field of interest this summer at Harvard University. 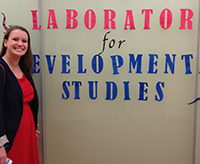 In a psychology lab for development studies, Baranay worked on a variety of projects focusing on social development in infants, and says the internship increased her interest in pursuing this area of research at graduate school. Baranay says although she was hesitant to take the internship at first because it was unfunded, ALSIP “helped phenomenally” with her cost-of-living expenses in Cambridge, Mass. To be eligible for the Arts and Letters Summer Internship Program, students must be rising juniors or seniors in the summer of 2014. Students may use university resources in their internship search, but must obtain the internships on their own accord. Students who are interested in applying can contact the Career Center’s funding program team by calling (574) 631-5200 to schedule a meeting. Originally published by Ben Horvath at al.nd.edu on December 04, 2013.